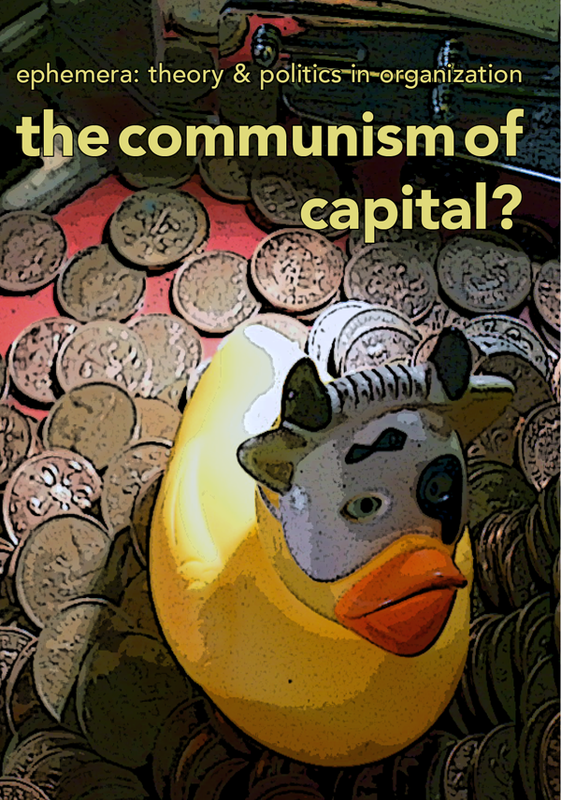 The communism of capital? What could this awkward turn of phrase mean, and what might it signify with regards to the state of the world today? Does it merely describe a reality in which communist demands are twisted to become productive of capital, a capitalist realism supplemented by a disarmed communist ideology? Or does the death of the capitalist utopia mean that capital cannot contain the antagonism expressed by Occupy and other movements anymore, and therefore must confront communism upfront? The 12 contributions to this latest issue of ephemera explore the valances of the paradoxical and seemingly incoherent expression that is ‘the communism of capital’. Collectively they stake out new territory for the theorisation and organization of political struggle in a context in which capital has become increasingly aware that its age-old nemesis might today be lurking at its very heart. You can order a print copy of the whole issue at your local bookstore or online! Does capital need a commons fix?